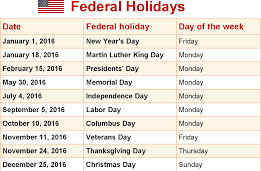 There are ten federal holidays in the United States which also double up as bank holidays. In addition, there is also Inauguration Day celebrated once every four years on January 20 following a presidential election. Banks in the US follow the holiday calendar of the U.S. Federal Reserve. When a holiday falls on a Saturday, it is observed on the preceding Friday; when it falls on a Sunday, it is observed on the following Monday.